Born in Baltimore, Maryland, Nick Saglimbeni moved to Los Angeles to pursue cinematography at the top-ranked USC School of Cinema. Shortly after graduation, Nick opened SlickforceStudio in downtown LA. In December 2009, after less than 5 years in as a magazine photographer, Nick photographed his 100th magazine cover. That same year, he won the Blackberry Business Award for development of signature retouching techniques. The National Association of Photoshop Professionals (NAPP) has awarded Nick with three Grand Prize GURU Awards, in photography, retouching, and compositing. In 2010, Nick released “Mastering Retouching”, which sold out its initial run during the pre-order phase. It continues to be one of the most popular retouching tutorials ever created. Based on overwhelming requests from aspiring photographers, Nick created the advanced lighting workshop, PhotoKamp, in 2010. In August 2011, Nick Saglimbeni created and launched WMB 3D: World’s Most Beautiful, the the first commercial magazine entirely photographed and designed in 3D. His advancements in 3D photography won him several awards, including Grand Prize in 3D at the Sony World Photography Awards in 2012. Nick currently photographs commercial campaigns for companies such as Sears, Nordstrom, Skechers, Neiman Marcus, Kardashian Kollection, Nuvo and more. 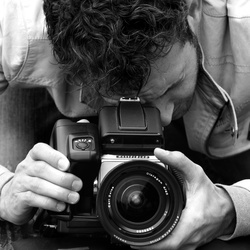 He is heavily involved in the photography of several charity campaigns, including Breast Cancer Charities of America, The Epilepsy Foundation, and PETA.